I’m so excited to be celebrating with Char. To share the joy of her 1,000,000th hit we are giving away one 8″x10″ print from my shop to two lucky readers. A little about myself and my shop. My name is Tricia Jones. 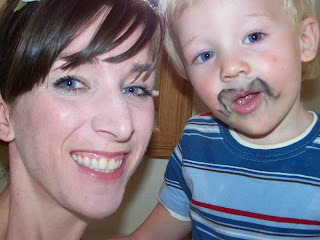 I have an oh so adorable little boy and an equally adorable husband. I love to make things whether it be with a sewing machine, a paintbrush, or a hot glue gun (which is one reason I love Char’s blog). I’ve told my husband that when we pay for craft supplies we are really paying for my therapy, because making things keeps sane. The results of my craft therapy can be seen on my blog Leafy Treetop Spot. Okay now back to my shop, and more importantly back to the giveaway. I offer several prints of my original paintings for sale at my Etsy shop – Leafy Treetop Shop. In my shop you will find a variety of bright and cheerful prints. Most of them depict animals in one form or another. I love painting animals-it is so much fun to create a character and give them emotion and feeling. They bring me joy and hopefully they will bring you some as well. My artwork has been hung everywhere from nurseries, to libraries, and even Doctor’s offices. I just happen to think that one of my images would look perfect in your home-let’s make that happen. Here is what you need to do to participate. 1-Visit my shop, take a look around, and decide which is your favorite print. 2-Hop on over to my blog Leafytreetopspot.blogspot.com, take a look around, and follow me if you like what you see. 3-Leave a comment here, and let us know which print is your favorite, and you’d like to win. Thanks for letting me share in the celebration Char! i would love to win! my favorite is the orange sky landscape – would look cute in my daughter's nursery! i would love the "night owl" for my baby girl's nursery! you are an enormously talented artist! I love the zebra! It's my little boy's favorite animal! 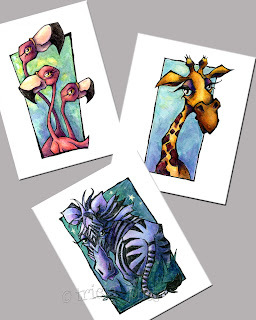 Oh the 5×7 animal portraits (with the flamingo, giraffe and zebra) would look oh so cute in our jungle/animal themed nursery! Flying the Coop is adorable. I LOVE LOVE LOVE Gravity!! Adorable! 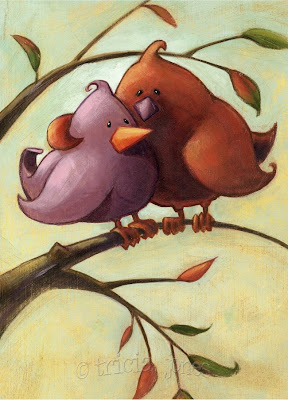 I love the Love Birds…so adorable! You are so talented! I LOVE the pigs! My little guy is obsessed with pigs and would love it in his room! We live in Hawaii so the "Body Surfing Turtle" is perfect! So cute!!! The love birds are my favorite!! I also follow your blog now and you have some beautiful work. I would have a hard time deciding between "Love Birds" (for my bedroom), "Giraffes in space" (for DD's room) or "Orange Sky Landscape" (for any room). What a great giveaway! My favorites are the zebra and the giraffe – either would be great in one of my expected grands nursery. i love the lovebirds print, and the business card holders are perfect, i might just NEED one. I love the "all the little piggies" soooo cute! I'm a new follower of your great blog too! I LOVE the Ibex print! I'd like to win the ibex! Very nice! Man, I had a HARD time choosing. I love the Ibex, and the Dancing Pig. But I think Orange sky landscape is my favorite. You are extremely talented! I hope I win. I like the orange sky landscape. I love the Gravity print, so adorable!! Love the Dancing Pig! Your stuff is so cute! love the elephant! will also be ordering some cresit card wallets- super cute!! I totally love the dancing pig and the orange sky landscape Is my second favorite. I also really like your wallets and just added one to my favorites so I wouldn't forget. I SO wish I had your talent!! I LOVE, LOVE, LOVE, the Flying the Coop, rustic chicken hen. Love her attitute!! I love the love birds! It's so cute!! I love the giraffes in gravity one. My favorite print is the love birds! Beautiful! My favorite are the animal prints. Just adore the elephant, giraffe, and flamingos. Pink Flamingos, definitely!!! Anything that reminds me of Florida, I Adore!!! Thanks for offering your fantastic artwork as a giveaway!!! Night Owl and Love Birds…. my two top favs! Your work is awesome! Thanks for the chance to win! That night owl is so dang cute! I would love to hang that in my home! Of course, the love birds is really fun too! I love the set of pig prints as well as the love birds. These are wonderful! Everything is so darn cute. Out of everything I like the All the Little Piggies. I'm torn! I love the dancing pigs & gravity. I love the art! It is so cute and doesn't cost an arm and a leg. I love the dancing pig, swimming turtle, and birds. Tricia's art is so unique–I love the long lashes Hard to choose just one favorite, but I think I like the zebra best of all. My favorite print in the night owl! It would look so cute in my twin girls owl themed bedroom! Wow! These are fantastic! I love "The Meadow Moose" The little bird is just too cute. All of your animals are so great. I think I like love birds best. I love your art! I would pick the body surfing turtle. It would look awesome in my kids' bathroom. The love birds are so cute! They are all cute though! Your prints are so cute! I like the piggies. Very Cute prints! I really like Every Little Piggie! I <3 'All The Little Piggies' AND 'Giraffes In Outer Space'. I love bright and cheery work. The dancing pig for sure!!! I LOVE the "love Birds"! Your work is wonderful! So cute all of them, but I'm totally in love with the dancing pig! They are all beautiful! I like the Love birds best, though. I'm lovin' the love birds! Your business card wallets are super cute, too! I Love so much at Tricia's site!! My favorites are All the Little Piggies and the Giraffes in Space -too cute, I'd love to win! thank you! Love the little piggies, but I think the giraffes are soooooooooo original! Love the Dancing Pig. It reminds me of the Olivia books, which is my daughter's favorite! I have a nursery that REALLY needs the Love Bird picture. Meadow Moose is sooo great!!! I absolutely LOVE the 8×10 Giraffe Art print. It would be perfect in my nephew's room! i love the night owl! that would look perfect in my daughters nursery!!! I'd probably have to go with the moose, as that's my husband's nickname/favorite animal! Although, i really ADORE the love birds and the night owl! Beautiful work, thank you for sharing!! I love every single one of the animal prints. So beautiful. 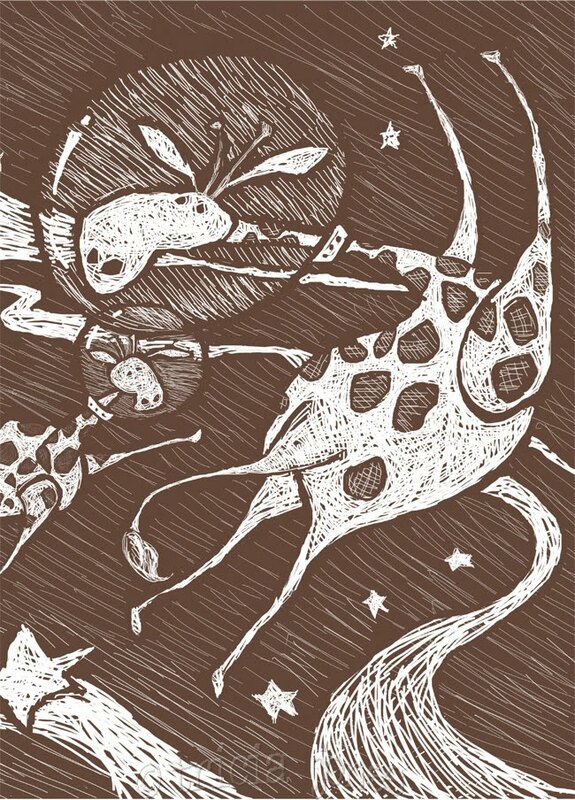 My favorite is the giraffe art print – gravity. It would look great in my son's new playroom! Ahhh! I love all of them. My little boy is an ENORMOUS animal lover. He has a farm bedroom theme so All the Piggies would be perfect for his room! But he has a jungle bathroom and giraffes are his favorite so the giraffe print would be awesome too. I follow your blog now too! The love birds are sooooo sweet! Gorgeous prints. I've hearted you on Etsy. Thanks for the chance to enter! Love Birds is so cute!!! I have to say that I love the Love Birds! Your work is beautiful and funky…I like it. I can't decide which piggie picture I like better. Well I love them all!!! I follow you… hahaha and could use ANY of them in my house!!! Love birds… or anything else!!! LOVE YA!!! I love your work – you are talented, creative, lively and fun! Since I am Canadian, I love The Meadow Moose – he rocks!! Thanks for the chance. Count me in! I just signed up to follow Leafytreetopspot!! Following leafytreetopspot… looks like fun! I love the set of animal prints. It would be hard to decide if I wanted to hang this at home, or my kids room at the library! So cute! So like everyone else I have a hard time choosing which is my favorite. Love the Love Birds and Orange sky landscape, but think the giraffes and night owl are fantastic too. AAAAHHHH! Decisions, decisions… I want the love birds for my room! Oh how fun! I love the 8×10 flamingos. I have a palm tree in my house with flamingo ornaments on it year round. This would match that perfectly! I love it. Thanks for sharing! I will definitely be checking out your shop more often! I love the giraffe or any of the jungle animals. It would go perfect in my boy's bathroom. gravity… my little guy is a little giraffe!! I would love to win All The Little Piggies. So cute. I LOVE, love the Love Birds. I need them in my girl's room! Everything is so cute! I think my fav is the body surfing turtle – hard to decide though! My favorite is the love birds! I love the love birds too! The Gravity piece would rock in my kids' room, but I would love to make the Flamingos or the Giraffe pieces work too! I like the orange sky landscape. I love a lot of your prints! Oh my goodness! I am in love with the pigs and the orange sky landscape! Crossing my fingers! My fave is definitely the love birds. It's just so sweet! 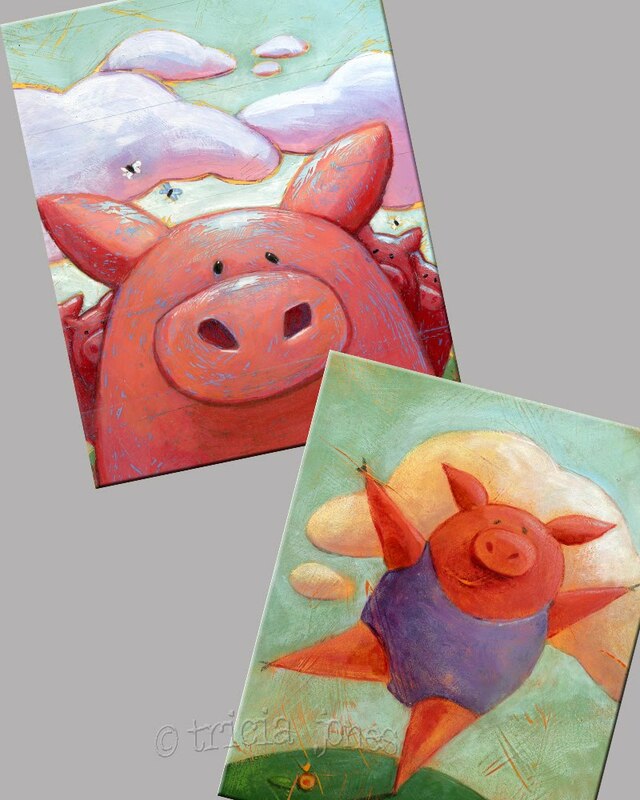 I love the dancing pig….my itty bitty would LOVE that in her room!!! I'm following her and totally scored an awesome coconut cream cake recipe!! WHOO HOOO! I love the Giraffe Gravity painting! It is way cute! You have amazing talent Tricia! I love the paintings, and I love the card holders. I like the love birds and the body surfing turtle. Love the angel fish! Perfect for my bathroom. Your art makes me want to redo my nursery and playroom. I love it. I love the jungle animals because that is what I did my little boy's room in. Very cute! I love them all, but Hallei loves the Angel Fish and Ellee loves the moose! Adorable! You are so talented! My favorite is the lovebirds. I love the "Love Birds" print!!! 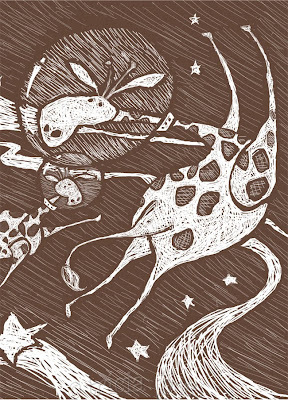 While I love the turtle, I have to choose Gravity, with the space giraffes, as my favorite. Its so quirky! I gotta win of these giveaways, right. They are all SO cute (esp the giraffes)! I love the 'Love birds'! Precious! I am now a 'follower' and I added your blog to my blogroll! These are so cute! I love the pigs and the moose the best. I love the giraffe – the moose is cute too, but I love the giraffe. We have a VERY tall family (my husband is 6'10") and we kind of have a thing for giraffes. Pink Flamingos is the print I would choose because the colors are so happy. You are so cool! Love your art! I personally love the credit card/business card holders! I love the giraffe in space! 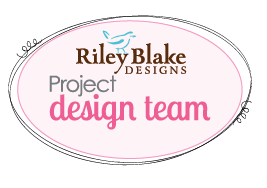 Beautiful work…I love the flamingos the best and they would go great in my craft room! I gotta say it's the lovebirds!! The body surfing turtle is adorable! I love the pig and the love birds. And how about those wallets, amazing. I loooove owls, so I would choose Night Owls! I would love a set of these prints, to be honest. But to choose one, Night Owl would be it.